It’s almost turkey time here in the United States and so I wanted to wish you a very Happy Thanksgiving! This year, Sean and I did something a little bit different simply because (as you may or may not know) we’ve been moving across country. If you do know that, it’s probably becoming a little bit of old news but we are hopefully set to arrive tomorrow for a late dinner with the family. Today, I’d like to take a moment to share some of the things I am grateful for and I’d like to invite you to share some of yours in the comments below. I am thankful for a family that loves, supports, and encourages me even when I might not be doing as well as I’d like. I am thankful for a community of like-minded sellers, creatives, and artists that I have fostered over the years online and in person. I am thankful for my husband who has kept me focused, reminded me that I am human, and propped me up when I’m too tired to keep going. I am grateful for the ability to move cross country without worrying (too much) about finances. I am grateful for my health, which I know all too well can change at a mere moment. 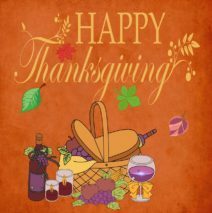 I am grateful for all of my followers, clients, and friends and hope you have an amazing day tomorrow. I will be announcing my Black Friday sale later in the evening on Thanksgiving and the codes will go live on Black Friday proper so you may enjoy time with your family and offline. Members of my VIP Facebook group COPYWRITING FOR CREATIVES will get exclusive access to a 25% discount code. If you want that code, you should probably join the group in advance. All other followers will be able to use a 20% discount code starting on Small Business Saturday that will last through Cyber Monday. Thank you Kate ! Wishing you a safe trip up to destination and a very Happy Thanksgiving.